USA Today has updated its massive college football salary database and recently published a piece on the exploding cost of employing a major-college football coach, which has nearly doubled since 2006. The payouts for service-academy coaches haven’t seen that big of a surge, at least in recent years. 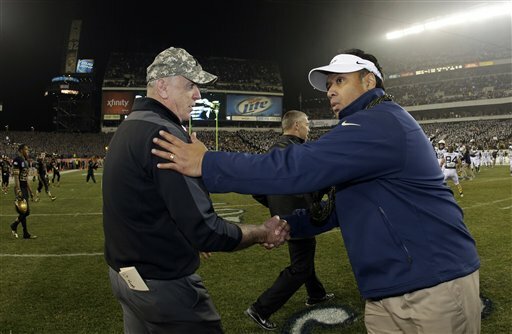 Navy head coach Ken Niumatalolo still leads the pack, earning a bit more than $1.5 million in 2013. That’s down from $1.6 million last year, but those figures likely all fall under the contract extension signed by the coach, terms undisclosed, in 2011. It’s good enough for 63rd on the overall list. Air Force head coach Troy Calhoun will pocket about $900,000 in 2013, according to the database, including more than $21,000 in “other income” beyond his Air Force Academy salary. That does not include up to $247,500 in potential bonus money. That income ranks him 72nd overall. Army’s Rich Ellerson brings up the rear with less than half of that amount, clocking in at $401,500 — 103rd overall. His potential bonus ranks in the top 50 in all college football — $550,000 — but if the deal is the same as the 2012 setup that included $150,000 for winning the Commander in Chief’s Trophy, a good chunk of that money is out of reach this year. Niumatalolo has no bonus money available in his deal, per the database. All three academy coaches fall under the major-college average of $1.81 million. Niumatalolo was above that average as recently as 2011, making a bit more than $1.5 million compared with a national average of $1.47 million. Niumatalolo’s the highest-paid coach of a nonconference program, edging out Notre Dame’s Brian Kelly, set to make a little less than $1.1 million. Navy will join the American Athletic Conference in 2015. Niumatalolo’s salary would put him in the middle of the pack among the 10 coaches now leading AAC teams, just behind sixth-place George O’Leary at Central Florida ($1.53 million). Calhoun ranks fourth out of the 12 Mountain West Conference coaches, well behind the MWC-leading $2.15 million pulled down by Boise State’s Chris Petersen. Alabama’s Nick Saban tops the list at $5.55 million. Among coaches whose salaries were included in the database, Todd Berry of Louisiana-Monroe took last place at $288,000.